Chinese have been using rice to make vinegar for over 2000 years, and there are three basic types of Chinese rice vinegar: white, red and black. It's made by a natural fermentation process with yeast and rice. Our Koon Chun brand is top quality, and this is a large bottle for generous use. Dark in color, it has a deep, almost smoky flavor. Black rice vinegar works well in braised dishes and as a dipping sauce. 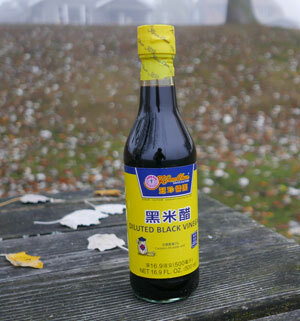 In Thailand, a tablespoon of black vinegar is mixed with a tablespoon of pickled ground chile with garlic and served in a small condiment dish as a wonderful, complex, mild all-purpose condiment dipping sauce. It can also serve as a substitute for balsamic vinegar. Mark Bittman (New York Times) recommended our black rice vinegar. Also, Bon Appetit magazine recommended ImportFood for Koon Chun black vinegar--stating it's delicious with cold noodles, when mixed with sesame oil. Ingredients: rice vinegar, color (caramel 1), salt, spices. Product of Hong Kong.